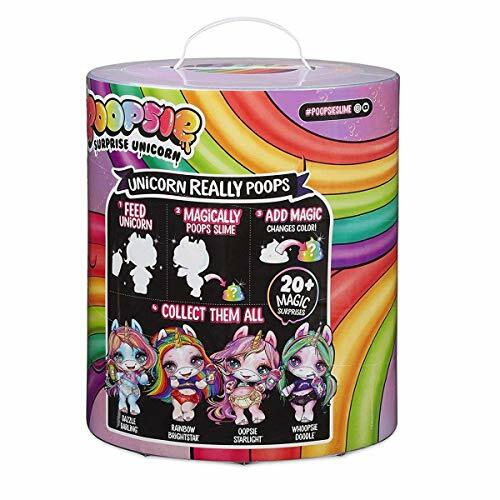 Poopsie Slime Surprise Unicorn - Dazzle Darling Or Whoopsie Doodle - $49.99 Shipped! Poopsie Slime Surprise Unicorn – Dazzle Darling Or Whoopsie Doodle – $49.99 Shipped! Score a GREAT DEAL on the Poopsie Slime Surprise Unicorn Dazzle Darling Or Whoopsie Doodle today for only $49.99 from Amazon! You will get FREE Shipping if you are a Prime member! If you are not an Amazon Prime member you can grab a FREE 30-Day Trial HERE! Get the all the Details of this deal below! Make magical unicorn poop (slime) with Poopsie slime surprise! with a little unicorn magic and sparkle, you can customize unicorn poop and transform it multiple times! When you gotta go, store the poop for magical fun anytime! Poopsie Surprise unicorn magically poop slime! Each time you feed your surprise unicorn and sit her on her glitter potty, she creates surprise, collectible unicorn poop (slime)! Transform your unicorn poop over and over again with unicorn magic! Over 20 magic surprises included with each surprise unicorns! Four unicorns to collect! Will you unroll Dazzle Darling or Whoopsie Doodle? Don’t miss this deal at Amazon Today on the Poopsie Slime Surprise Unicorn Dazzle Darling Or Whoopsie Doodle for only $49.99! Previous Post: Sharpie Color Burst Permanent Markers, 24-Count – Only $8.59! Next Post: Hallmark Christmas Ornaments Set of 6 ONLY $24.64!